Parasound Products isn’t the first name that comes to my mind when considering affordable digital processors and transports. The San Francisco—based company is best known for producing high-value pre amplifiers, power amplifiers, and Home Theater components, some of which are designed by the legendary John Curl. But Parasound has also been making a full line of digital processors for more than three years. In addition, Parasound distributes the highly ac claimed C.E.C. line of belt-drive CD transports, as well as selling a belt-drive transport under its own name. Parasound has revamped its digital processor line with new HDCD-compatible processors —and added an Ultra- Analog-based model. I thought we should take a look at what Parasound has to offer in the digital arena. If the company’s enviable reputation for high value and good sound for the money holds true for their digital gear, the $950 D/AC-1100 and $1995 D/AC-2000 Ultra may be contenders at these fiercely competitive price points. Despite its moderate price, the D/AC 1100H0 is housed in a sturdy, full-sized chassis and boasts a complete array of inputs and front-panel controls. The good-looking unit has a row of five square buttons that select among the four inputs (two coaxial, one AES/ EBU, one TosLink) and invert absolute polarity. LEDs indicate the input selected, the sampling frequency, polarity inversion, de-emphasis, and when the unit is decoding an HDCD-encoded source. The unit’s rack-mounting holes seem a little out of place, but you can fill them with the supplied inserts so they don’t show. above: D/AC 1100-HD (front exterior). The rear panel holds gold-plated dig ital input and analog output jacks, along with an IEC AC line-cord jack. A digital output jack (RCA) is included for driving a digital recorder. Analog output is unbalanced only. 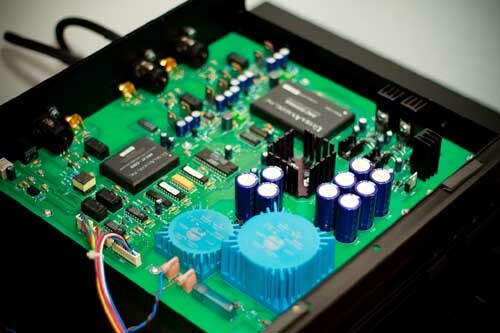 The D/AC-1100-HD design was a collaboration between Parasound’s in-house engineering staff and an outside consultant. The Taiwan-made D/AC 1100-HD is similar to Parasound’s earlier D/AC-1000, but with HDCD decoding and an improved analog output stage. The power supply is massive. Three laminate transformers flank the unit’s left-hand side, and supply power to 11 separate three-pin (TO-220 type) volt age regulators, these cooled by over sized heatsinks. Rows of large electrolytic filter capacitors dominate the inside, most of them high-quality Nichicon Muse types. Although most de signers would prefer more filter capacitance to less (up to a point), this is no guarantee of good sound. A Scientific Conversion pulse transformer couples the selected digital input to a Crystal CS8412 input receiver. Digital filtering is performed by the Pacific Microsonics PMD100 HDCD decoder/filter. The DACs are high-quality Burr-Brown PCM63s, but the middle, “P-J” grade (the “K” designation is the least expensive, and the “P-K” is the most). Although the owner’s manual suggests the D/AC 1100 uses two PCM63s per channel (“Two Burr-Brown PCM63P-J 20-bit push-pull for each channel and fully balanced digital operation”), the D/AC 1100 uses only one PCM63 per channel. Perhaps the confusion comes from the PCM63’s internal “Colinear” architecture, which uses two DAC circuits per monophonic DAC package. Then again, the owner’s manual may be referring to Parasound’s D/AC ($1495), which does use two PCM63s per channel. 1. John Curl didn’t design the two Parasound processors reviewed here. 2. For the curious, I counted six 6800uF, four 4700uF three 2200uF four 1000uF and four 470uF caps, all of which are bypassed with film-type caps. The total of 72,080uF is more power-supply capacitance than is found in many power amplifiers. 3. Burr-Brown seems to be trying to force processor manufacturers into using their PCM1702 DAC through steep price increases on the PCM63. Many designers prefer the PCM63 despite the PCM1702’s better low-level linearity but I suspect that Burr-Brown wants to phase the PCM63 out. The PCM1702 is much smaller and is said to be easier to manufacture than the PCM63. Parasound absorbed the PCM63’s price increase rather than switch to the PCM1702. Parasound D/AC 1100-HD digital/analog converter with dual Burr-Brown PCM63 20 bit DACs and a Pacific Microsonics PMD 100 HDCD decoder/filter operating at 8x oversampling. Digital inputs: two coaxial (RCA jacks), AES/EBU (XLR jack), TOS optical. Analog output unbalanced on RCA jacks. S/N ratio: >108dB, 113dB typical. Channel separation: >100dB (no frequency specified). THD: <0.015% at 1kHz Phase linearity ±0° at 20kHz. Dimensions: 19"W by 3" H by 13.125" D.
Serial number of unit tested: 206657. Price: $950. Parasound D/AC-2000 Ultra digital/analog converter with UltraAnalog dual-20-bit DAC and a Pacific Microsonics PMD 100 HDCD decoder/filter operating at 8x.over-sampling. Digital inputs: coaxial (RCA jack), AES/EBU (XLR jack), ST-type optical, TosLink optical. Analog outputs: balanced on XLR jacks, unbalanced on RCA jacks. Output impedance: 102 ohms (balanced), 51 ohms (unbalanced). Frequency response: DC-20kHz +0, -0.5dB. S/N ratio: >103dB. Channel separation: >104dB at 20kHz, > at 1kHz. THD: <0.0015% at 1kHz, frill-scale output. Maximum jitter: <40ps RMS (10Hz-40kHz). Dimensions: 19" W by 3' H by 13.125" D.
Serial number of unit tested: S12510038. Approximate number of dealers: 350. A pair of Analog Devices AD841 op amps convert the DACs’ current out puts into voltages. The AD841 is an excellent choice for this crucial stage, and is also used in some expensive converters. Two more Analog Devices opamps per channel (the AD845) follow the I/V converters and from the output buffers. The active, third-order output filter is built around an Analog Devices AD746 op-amp. Putting four op-amps in series seems like an overly complex approach. Commendably, the D/AC-1100 uses analog-domain attenuation to pro vide the 6dB level reduction required by the HDCD license for the replay of non-HDCD-encoded discs. The alternative is simply to set a pin on the PMD100 to perform digital-domain attenuation, but at the penalty of 1 bit of ultimate resolution. I must report a minor glitch with the review sample. The front-panel 44.1kHz LED illuminated whenever the unit was powered, whether or not it was locked to a 44.1kHz source. When I fed the D/AC-1100’ with 32kHz and 48kHz sources on the test bench, the 44.1kHz LED stayed illuminated, even though the D/AC-1100 was locked to other sampling frequencies. Listening: My main point of com parison for the D/AC-1100 was the $795 Audio Alchemy DDE v3.0 processor. Alchemy sells the DDE v3.0 with the DTI v2.0 jitter attenuator for $995: this is the combination to beat in this price range, in my opinion. The D/AC-1100 had a characteristic sound that was strongly evident during the auditioning. The processor reminded me of a classic tube amplifier: The D/AC combined warm bass with a soft low-resolution presentation to create an easy going and relaxing sound. Specifically, the bass was big, round, and full. The D/AC-1100 made me think of a professional signal processing device called “Big Bottom,” which warms up the low end. The already big- sounding acoustic bass on Doug Mac Leod’s Come to Find (AudioQuest AQ CD 1027), for example, was rendered even bigger-sounding by the D/AC 1100 Even recordings with a tight and lean bass sounded weightier and fuller when reproduced by the D/AC 1100. I like bass warmth, but the D/AC 1100HD went too far in that direction, to the point where the bass was slow, fat, and ill-defined. It was difficult to differentiate pitch, and the bass lacked dynamics and impact. I couldn’t hear the attack and decay of the bass strings very well, and the bottom end was missing snap and liveliness. Every other processor on deck (including the DDE v3.0/DTI v2.0 pair) sounded more upbeat and rhythmically coherent than the D/AC-1100. I was also bothered by the D/AC 1100 lack of dynamics over the rest of the spectrum. The snare drum in Robben Ford and the Blue Line (Stretch STD-1102) had a reduced sense of snap and power, giving this rhythmically driving music a lackluster character. The D/AC-1100 soft dynamics and sluggish bass resulted in a slow presentation that was missing energy and excitement. This was my strongest criticism of the D/AC-1100. The D/AC-1100 overall perspective was the most forward in the mids of the five processors I had on hand (DDE v3.0/DTI v2.0, Classé DAC 1, PS Audio UltraLink Two, and the two Parasound units). The mids were projected slightly forward of the loudspeakers, in sharp contrast with the D/AC-2000 Ultra’s more laid-back sound. The D/AC-1100 seemed to spotlight the midrange and upper bass, much the way some tubed amplifiers draw your attention to those frequency regions. The mids had some hardness and edge, revealed as a slightly metallic flavor to Ralph Towner’s superbly recorded acoustic guitar on Oregon’s Beyond Words CD (Chesky JD130). On the same record, Paul McCandless’s soprano sax and oboe sounded more synthetic than when heard through the DDE v3.0/DTI v2.0. The D/AC-1100 had a bit of a veiled coloration in the mids and treble that reduced the sense of immediacy, despite its forward presentation. Similarly, the treble was more subdued than the DDE/DTI pair, yet was simultaneously a little hashy sounding. Although the Parasound sounded less bright than the Audio Alchemy pair, it tended to emphasize vocal sibilance. The D/AC-1100 treble was less open and detailed than I expected from a processor in this price range. There was a lack of air, top-end extension, and openness to its presentation. We auditioned the D/AC 1100-HD and D/AC-2000 Ultra with three trans ports the Mark Levinson No 31 the Sonic Frontiers SFT-1 and Parasound s new C/BD-2000 belt-drive unit (review due next month) Digital interconnects were primarily the excellent Illuminati true 75 ohm RCA cable (my reference coaxial cable) an AudioQuest Diamond x3 balanced cable for AES/EBU connecti on, and Parasound s new Data Bridge AES/EBU cable The Para sound processors performance was evaluated on their own and in direct matched-level comparisons with an Audio Alchemy DDE v3 0/DTI v2 0 combination ($995) a PS Audio UltraLink Two ($2295) and a Classe DAC 1 (now $3995) Loudspeakers were Genesis II 5s driven by a pair of Audio Research VT15O monoblocks via short runs of AudioQuest Dragon II The preamp was a Sonic Frontiers SFL-2 Inter connects included AudioQuest Lapis AudioQuest Diamond, and WireWorld Gold Eclipse (balanced and unbalanced) The system sat on a Merrill Stable Table and a Billy Bags 5500-series rack Power to the system was conditioned by an MIT Z-Center Z-Stabilizer II, and Z Cord II AC cords The processors under audition were evaluated with their stock AC cords. The D/AC-1100 soundstage was good for a $950 processor, with nice depth and separation between instruments. Depth, however, tended to be portrayed in several discrete layers rather than along a continuum from the front of the soundstage to the back. The D/AC-1100 also lacked the sense of air at the soundstage’s outer edges that I heard from the DDE/DTI combination. Driving the D/AC-1100 with Parasound’s C/BD-2000 belt-drive CD transport was a mixed bag. The transport’s softish bass didn’t help the D/AC 1100 but the C/BD-2000 did have a smooth and laid-back midrange that complemented the processor. To its credit, the D/AC-1100 flaws were less objectionable than those of some processors. The overly warm bass and overall soft presentation are far preferable to an etched and strident rendering. Although the D/AC-1100 sound wasn’t to my taste, this type of presentation has its adherents. Witness the popularity of the EAD processors, which in my opinion trade resolution for smoothness, and bass definition for warmth. Measurements: The D/AC-1100 maximum output level was 2.37V, a little higher output than that of most HDCD-based processors. Output impedance measured a low 28 ohms at any audio frequency. DC offset levels were a low t7mV (left channel) and 2.8mV (right channel), and the unit doesn’t invert absolute polarity. 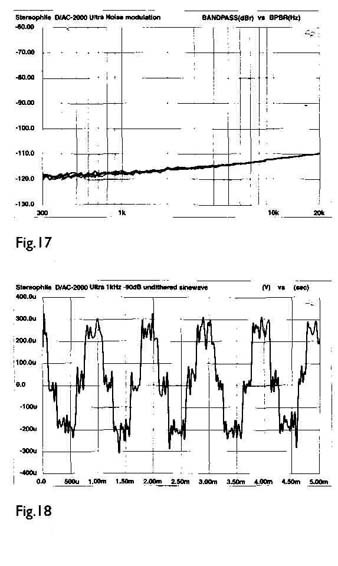 Fig.1 Parasound D/AC- II 00 frequency response (top) and de-emphasis error (bottom) (right channel dashed, 0.5dB/vertical div.). Fig.2 Parasound D/AC-1100 crosstalk (R—L channel dashed, 10dB/vertical div.). The D/AC frequency response (fig.1, upper trace) was flat but with a mildly positive de-emphasis error (lower trace), between 0.1dB and 0.2dB. It may just be audible as a greater immediacy and brightness when listening to pre-emphasized CDs because of the error’s three-octave bandwidth. Channel separation (fig 2) was excellent, the crosstalk measuring below 105dB at any audio frequency, and reaching a high -120dB at 1kHz. This easily beats the 1kHz-specified 100dB separation in the owner’s manual. 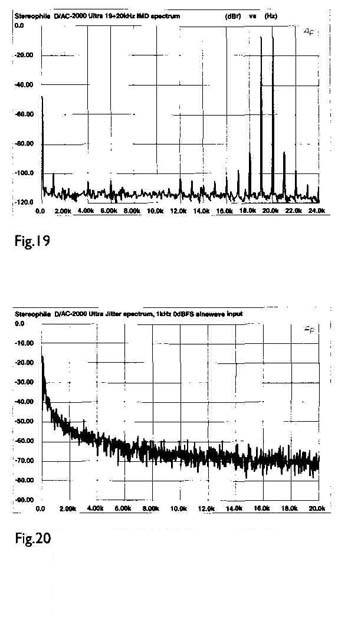 A 1/3 spectral analysis of the D/AC-1100 output when decoding a 1kHz, —90.3IdBFS dithered sinewave (fig.3) shows the unit has good linearity, low noise, and total absence of power- supply noise in the audio signal. This is excellent performance, particularly for a converter costing less than $1000. This test, however, revealed that the D/AC-1100 truncates incoming 20- bit data to 16-bits. I routinely use 20-bit resolution test signals now that processors are available which will pass 20-bit data to the DACs. Feeding the D/AC 1100 with a 20-bit dithered source from the Audio Precision System One Dual Domain resulted in the four Least Significant Bits (LSBs) being truncated, and with them, the dither. The result was the appearance of a lot of harmonic distortion because of the lack of dither. When I saw the high distortion, I repeated the test with a 16-bit test signal to create the plot of fig.3. Note that even though the Crystal CS8412 input receiver, PMD100 digital filter, and PCM63 DACs will all operate on 20- bit data or more, the D/AC-1100’s internal architecture provides only 16-bit pathways. The CD format is, of course, limited to 16-bit resolution, making this entire discussion moot. The only time the D/AC 1100-HD’s 16-bit limit is an issue is if you use an Audio Alchemy DTI Pro or DTI Pro 32 or the Meridian 518, all of which can be set to output digital words longer than 16 bits. A wideband spectral analysis of the D/AC-1100 output when fed “digital silence” (all encoded data words are zero) shows a low noise level and a fairly aggressive analog output filter, seen as the rapid attenuation just above the audioband (fig.4). The right channel is also slightly quieter than the left channel. Low-level linearity (fig.5) was good, as I’ve come to expect from the Burr-Brown PCM63 DAC. A very slight negative error can be seen below —80dB, but the DACs are nearly perfect to -105dB. In addition, both DACs perform identically. Note that the PCM63 needs no MSB trimmer, and that its linearity won’t change over time. Fig.6 shows the D/AC-1100 noise-modulation plot. The traces are tightly grouped, indicating that the processor’s noise level and the spectral balance of that noise don’t change as a function of input level. This is excellent performance. Fig.3 Parasound D/AC- 1100 spectrum of dithered 1kHz tone at -90.31 dBFS, with noise and spuriae (16-bit data, 1/3 octave analysis, right channel dashed). Fig.5 Parasound D/AC-1100, departure from linearity (right channel dashed, 2dB/vertical div.). Fig.7, the D/AC reproduction of a 1kHz, —90.31dBFS undithered sinewave, reveals a good waveshape and fairly low noise. However, some DC offset shifts the test signal’s zero crossing point to the 50uV horizontal line. Driving the D/AC-1100 with data representing a fill-scale mix of 19kHz and 20kHz sinewaves produced the spectrum of fig.8 at the unit’s output The intermodulation products are few and low in level, indicating good performance. This is one of the better-looking IMD plots I’ve seen. Moving next to the D/AC-1100 jitter, I measured the RMS jitter level at the PCM63’s 8x word-clock pin using the Meitner LIM Detector, and made an FFT-derived spectral analysis of the jitter. The measurement bandwidth was 400Hz—20kHz. Fig.9 is the jitter spectrum when the D/AC-1100 was decoding a 1kHz full-scale sinewave from the CBS Test Disc played on a PS Audio Lambda transport. The spectrum is dense with periodic jitter components, seen as spikes in the trace. The RMS jitter level was a rather high 330ps. With a test signal of all zeros, the RMS jitter level dropped to 260ps and produced a relatively cleaner spectrum (fig.10). When decoding the most difficult test signal for jitter—a 1kHz, —90dBFS sinewave (fig.11) —the periodic jitter components associated with the audio signal rose (the spikes at 1kHz, 2kHz, and 4kHz), and the RMS jitter level increased to 450ps—almost half a nanosecond. This jitter performance is mediocre, and less good than is possible with a Crystal C58412 input receiver and PMD 100 filter. Other than the rather high jitter, however, the D/AC 1100-HD had good bench performance. The D/AC-2000 Ultra gets rid of the D/AC-1100’ digital output (a seldom-used feature), but adds balanced outputs on XLR jacks. One each of every digital input is provided (RCA, AES/EBU, TosLink, ST-type optical) at the standard price. AC input is filtered before reaching the unit’s two custom toroidal transformers, one to supply the analog circuits and one for digital electronics. The power supply features eight separately- regulated stages, all with three-pin voltage regulators. The D/AC-2000 Ultra uses a fraction of the filter capacitance found in the D/AC-1100. Fig.7 Parasound D/AC-1100, waveform of undithered 1 kHz sinewave at —90.31 dBFS (16-bit data). Fig.8 Parasound D/AC-1100, HF intermodulation spectrum, DC—24kHz, 19+20kHz at 0dBFS (linear frequency scale, 20dB/vertical div.). Fig.9 Parasound D/AC-1100 word-clock jitter spectrum, DC—20kHz, when processing 1kHz sinewave at 0dBFS; PS Audio Lambda transport (linear frequency scale, 10dB vertical div., 0dB=1ns). Fig. 10 Parasound D/AC-1100 word-clock jitter spectrum, DC—20kHz, when processing digital silence; PS Audio Lambda transport (linear frequency scale, 10dB/vertical div., 0dB =1ns). Fig. 11 Parasound D/AC-1100, word-clock jitter spectrum. DC—20kHz, when processing 1 kHz sinewave at —90dBFS; PS Audio Lambda transport (linear frequency scale, 10dB/vertical div., 0dB=1ns). The D/AC-2000’s two optical inputs and two electrical inputs are selected separately by relays. A network ensures that the electrical inputs present the proper input impedance to the digital source driving the D/AC-2000 —75 ohms for coaxial and 110 ohms for the AES/EBU input. This circuit is followed by a Scientific Conversion 2:1 step-up transformer that increases the signal voltage for input to the low-jitter UltraAnalog AES21 input receiver module. Digital filtering is performed by the Pacific Microsonics PMD 100 HDCD decoder. The 8x-oversampled audio data are converted to an analog signal with an UltraAnalog D20400A 20-bit two-channel DAC module. Although the D/AC-2000 Ultra has balanced outputs, the balanced signal is created in the analog domain after the DACs, not by using two DACs per channel (this is an expensive technique you wouldn’t expect in a $2000 processor). The D20400A’s word-clock is conditioned with a jitter-reduction circuit located right next to the DAC. The jitter-reduction circuit consists of a Type D flip-flop that receives the 256x bit- clock signal from the AES21 input receiver along with the 8x clock from the PMD 100. This circuit reportedly reduces jitter at the point where jitter matters — on the clock signal that controls when the DAC converts its audio samples to analog. Like the D/AC-1100 the D/AC 2000 uses analog-domain attenuation to achieve the 6dB of attenuation of non-HDCD-encoded sources required by the HDCD license. Analog-domain attenuation is generally better-sounding than the PMD100’s digital-domain attenuation. Output filtering is via a passive LRC network. The D/AC-2000 Ultra’s analog out put stage is radically different from that used in the D/AC It consists of a PMI OP-275 dual op-amp, along with discrete transistors operating within the op-amp’s feedback loop. The OP-275 also acts as an inverter to generate the balanced signal that appears on the rear-panel XLR jacks. Each leg of the balanced signal is driven by an npn/pnp transistor pair in hefty TO-220 packages. These transistors, not the OP-275, drive the outputs. Other, smaller npn/pnp transistor pairs pull current through the OP-275’s output stage to bias it into class-A operation. The direct-coupled output stage uses no DC servo to prevent DC offset from appearing at the analog output jacks. Instead, all UltraAnalog DACs are trimmed during manufacturing to have less than 1mV of offset. Listening: The D/AC-2000 Ultra couldn’t have sounded more different from the D/AC-1100. In fact, it was almost as though the D/AC-2000 Ultra’s sonic character was the inverse of that of the lower-priced unit. ‘Where the D/AC bass was overly warm, the D/AC-2000 Ultra’s bottom end was lean and tight Moreover, the D/AC 1100 overall softness and lack of detail were in stark contrast to the D/AC-2000 Ultra’s fine rendering of detail and crystal clear transparency. But it does a disservice to the D/AC 2000 Ultra to praise it in relation to the D/AC-1100 I switched to the D/AC-2000 Ultra for most of my plea sure listening right after removing the state-of-the-art Spectral SDR-2000 Pro processor from my system (Spectral wanted it back). The Spectral is a tough act to follow, but the Parasound was not disgraced by the comparison. This processor stood head-to-head with some of the best-sounding converters I’ve heard — and held its own. The D/AC-2000 Ultra’s overall character was much like that of the Classe DAC 1 I raved about. Indeed, the two processors shared many superb qualities. As did the Classe, the Parasound D/AC-2000 Ultra sounded clean, tight, and spacious, and displayed a wonderful dynamic agility. Starting with the bass, the D/AC 2000 Ultra had a nice tightness and punch that extended all the way down into the bottom octave. Kick drum had a satisfying solidity and impact that conveyed the music’s rhythmic drive and power. The D/AC-2000 Ultra presented a “suddenness” to kick drum (and kettle drum in symphonic music) that was exceptional. The D/AC-2000 Ultra beautifully conveyed the dynamic envelope of low-frequency impacts. Bass depth was also superb; bass drum had nice weight and power, the antithesis of the “pencil hitting an oatmeal container” syndrome that robs music of its drive. The mid-bass favored tautness and pitch definition over weight and authority. The bottom end was as tight as a stretched trampoline, a characteristic that let me hear lots of bass detail and nuance. I would have liked a little more warmth and power, however. Bass guitar was missing some of the “purring” quality that is so satisfying, and orchestral music tended to sound a little lacking in heft and authority. The D/AC 2000 Ultra’s mid-bass to lower midrange region tended to be analytical rather than visceral. In comparison, the PS Audio UltraLink Two had more warmth, weight, and “meat on the bone,” but its bass was not quite as defined as the Parasound’s. The more expensive Classe DAC 1 was at another level of quality, however, with power, depth, tautness, and dynamics that are state-of-the-art. The D/AC-2000 Ultra’s soundstage performance was beyond anything I’ve heard in a similarly priced processor. The Parasound presented instrumental images against a jet-black background, with deep silences between notes. The sense of air and bloom was also extraordinary for a $2000 processor. A good example was the previously mentioned Oregon disc, Beyond Words. Paul McCandless’s woodwinds seemed to float in space slightly behind the loud speaker plane. Compared to Ralph Towner’s guitar, the woodwinds sounded more distant. Either McCandless was farther away from the microphones, or his instruments excited the room’s reverberation more strongly, giving the impression of greater distance. At any rate, the D/AC-2000 Ultra clearly resolved this spatial information in a way that lesser processors didn’t. This resolution of soundstage cues was wonderful on orchestral music, with the D/AC-2000 Ultra maintaining a clear and distinct separation of the individual sections. The music was anything but smeared and blurred. The dense and complex orchestrations on Zappa’s The Yellow Shark (Barking Pumpkin 11.2- 71600) were beautifully unraveled by the D/AC-2000 Ultra, letting me hear what every instrument was doing. In the ability to throw individual images between and behind the loudspeakers, the D/AC-2000 Ultra was only a notch below the Classe and better than the UltraLink Two. Soundstage depth was outstanding, as was the sense of transparency. The D/AC-2000 Ultra revealed layers of depth right back to the reverberation at the hall’s rear wall. The expansive sound- stage was surrounded by a wonderful bloom that extended beyond the loud speaker boundaries. Listening to Anne- Sophie Mutter’s unaccompanied violin on her recording of the Ravel Tzigane (Deutsche Grammophon 437 544-2) was particularly revealing of the various processors’ renderings of hail reverberation. Among the processors under audition, save the Classe, the D/AC-2000 Ultra presented — by a wide margin — the most realistic impression of a violin in a concert hall. The D/AC-2000 Ultra was far ahead of the D/AC 1 DDE v3.0/DTI v2.0 pair, and even the UltraLink Two in portrayal of space, depth, and resolution of reverberation decay. This recording also threw into sharp relief the relative amounts of grain presented by the processors. The D/AC 2000 Ultra had a surprisingly smooth and liquid midrange and treble, with very little grain or grit. The clean treble presentation added greatly to the processor’s overall musicality. Surprisingly, the D/AC-2000 Ultra was smoother and cleaner than even the Classe DAC 1. Vocal sibilance, hi-hat, and violin were all rendered with a purity of timbre that was among the best I’ve heard from any processor. Fortunately, the D/AC-2000 Ultra didn’t achieve this smoothness by glossing over musical detail. In fact, the Parasound was highly resolving of musical information in a way that reminded me of the Classe processor. The music was presented with a finely filigreed quality, with lots of nuance, fine structure, and inner detail. The Classe was, however, a notch higher in its resolution and portrayal of low-level musical information. The D/AC-2000 Ultra’s overall perspective was on the laid-back side of reality; in contrast to the UltraLink Two’s more forward rendering. The Parasound processor put the soundstage just behind the loudspeakers, with very little projection to the front. This perspective tended to make me “lean into” the music more (a good thing), but also slightly diminished the sense of life, palpability; and presence. I felt a slight loss of immediacy with the D/AC-2000 Ultra, but not to the extent of feeling musically unfulfilled. Of the five processors under audition, the D/AC 2000 Ultra easily sounded the most laid-back. In short, the D/AC-2000 Ultra totally outclassed the D/AC-1100 easily beat the DDE v3.0/DTI v2.0 pair, was a notch better than the UltraLink Two in just about every area of performance, and even approached the stunning — and twice-the-price —Classe DAC 1 in some respects. I had to constantly remind myself that this was a $2000 processor, not a megabuck unit. The D/AC-2000 Ultra was a real find. Measurements: The D/AC-2000 Ultra’s maximum output level when decoding a 1kHz full-scale sinewave was 5.45V at the balanced jacks and 2.73V at the single-ended outputs. Out put impedance measured 102 ohms (balanced) and 51 ohms (unbalanced) across the audioband. Despite the D/AC-2000 Ultra’s lack of DC-blocking capacitors or DC servo, I measured absolutely no DC at any analog audio output. The unit doesn’t invert absolute polarity, and locked immediately to 32kHz and 48kHz sampling frequencies. Fig.12 shows the D/AC-2000 Ultra’s frequency response and de-emphasis error. The HF response rolls off more rapidly than many processors (—0.7dB at 20kHz), but this should not be too significant. 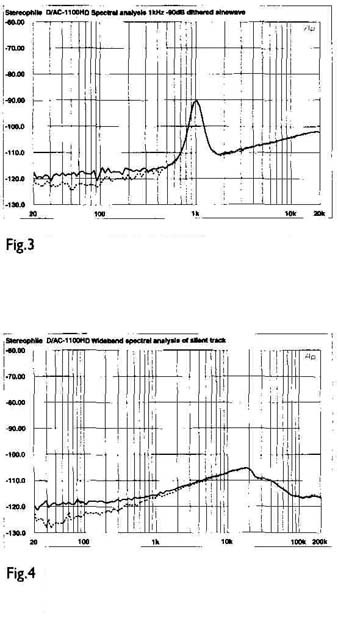 The de-emphasis tracking was perfect, the result of the digital-domain de-emphasis performed in the PMD 100 filter. digital-domain de emphasis gives perfect frequency-response performance it does not give the noise-floor lowering typical of good analog-domain de emphasis reduction. The unit’s channel separation (fig.13) was excellent, with the right-channel crosstalk measuring more than 10dB better than the left-channel at some frequencies. Fig.14, a spectral analysis of the D/AC-2000 Ultra’s output when decoding a 1kHz, —90.31 dBFS dithered sinewave, was made with a 20-bit source. Unlike the D/AC-1100 the D/AC-2000 Ultra will pass full 20-bit data from input to the DACs. 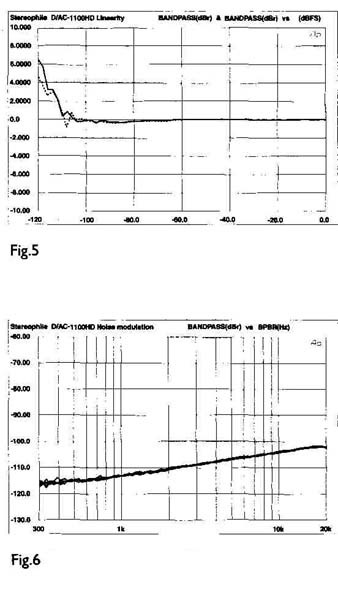 Note the expanded scale (to —140dB) in fig.14 needed to show the D/AC-2000 Ultra’s 20-bit performance. As is typical with these measurements, we can see a hint of second- and third-harmonic distortion as slight bumps in the trace at 2kHz and 3kHz. The overall noise level is low, and the analog signal is free from power-supply noise. There is just the slightest hint of 60Hz noise, seen as the almost imperceptible peaks in the traces at 60Hz. The tight channel is about 7dB quieter than the left channel. A wideband spectral analysis of the D/AC-2000 Ultra’s output when fed digital silence (fig.15) confirms the unit’s low noise, and its gentler output filter compared with the D/AC 1100-HD. Fig.16 shows the D/AC-2000 Ultra’s excellent low-level linearity. 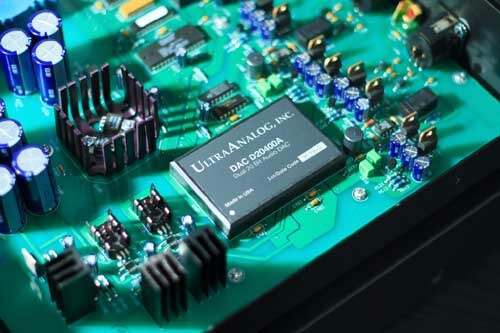 Both halves of the UltraAnalog dual DAC perform identically, with the DACs good to about —110dBFS. The D/AC 2000 Ultra’s noise-modulation plot (fig.17) shows tight trace groupings, but with a little divergence below about 1kHz. Above that frequency; the five traces overlap so closely it almost looks like a single trace —which is nearly perfect performance. Fig. 14 Parasound D/AC-2000, spectrum of dithered I kHz tone at —90.31 dBFS, with noise and spuriae (20-bit data, V,-octave analysis, right channel dashed). Fig. 15 Parasound D/AC-2000, spectrum of digital silence (20-bit data, 1/3-octave analysis, right channel dashed). 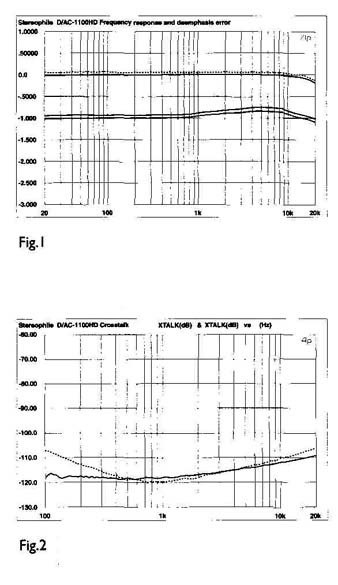 An examination of the D/AC-2000 Ultra's reproduction of a 1kHz, -90.31dBFS undithered sinewave (fig.18) shows some differential nonlinearity in the DACs. If you look closely, you can see that the positive half of the wave form has a slightly higher amplitude than the negative portion of the wave. With no DC offset, the zero crossing occurs exactly at the DV horizontal division. Every positive peak exceeds the +200pAT division, while the negative peaks barely reach the -200 division. This error is slight however; the wave form looks better than that reproduced by most processors. The D/AC-2000 Ultra's IMD spectrum (fig.19), made by driving the processor with data representing a frill-scale mix of 19kHz and 20kHz tones, was clean and free from intermodulation products. The 1kHz difference product (20kHz-19kHz) just reaches the -100dB level. 'This performance isn't quite as good as that measured in the D/AC-1100 however. The D/AC-2000 Ultra had very low jitter and an exceptionally dean jitter spectrum. Fig 20 is the jitter spectrum of the 8x de-glitch clock signal when the D/AC-2000 Ultra was processing a 1kHz, 0 dBFS sinewave. (The de-glitch clock in' UltraAnalog-based processors is equivalent to the word clock in other converters -- it controls when the DAC converts digital input samples to an analog output current.) This spectrum was taken at the output of the de-jittering flip-flop located right next to the UltraAnalog DAC. We can see virtually no signal-correlated jitter components, and a clean spectrum overall. 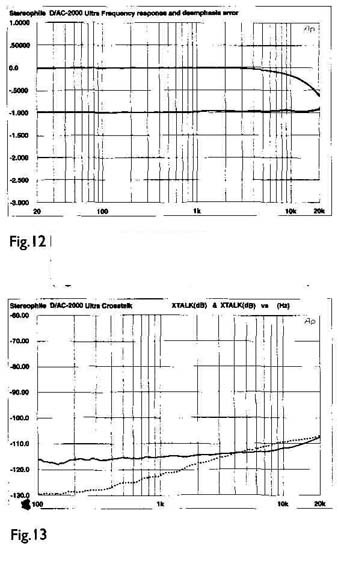 Compare fig20 to fig.9, the same measurement made on the D/AC-1100. The RMS jitter level of the D/AC 2000 was also low, (in contrast to 330ps under the measuring just 30ps the D/AC-1100 same test conditions). With an input of all zeros--a measurement that indicates the processor's internal intrinsic jitter in the absence of jitter-inducing test tones--the D/AC 2000 Ultra's spectrum was completely clean (fig.21). Comparing fig.20 to fig21, we can see that the presence of the test signal in ally less clean fig20 creates a marginally less-clean spectrum. The RMS jitter level in fig21 was a very low 22ps. Fig22 is the D/AC-2000 Ultra's jitter spectrum when fed a 1kHz, -90 dBFS sinewave. We can see the characteristic spikes at 1kHz and 2kHz, indicative of signal-correlated jitter. Note, however, components are low in that the periodic level, and that the rest of the spectrum is clean. The RMS jitter level rose to 55ps with this test signal. These jitter measurements indicate that the D/AC-2000 Ultra has low intrinsic jitter, as well as the ability to isolate the clock from signal-induced interface jitter. The nearly constant jitter levels and spectra with these varied test signals indicate excellent performance. These measurements had been made at the output of the jitter-reduction circuit. Just for fin, I repeated the measurements on the clock at the input of the flip-flop, to test the circuit's efficacy. Fig23 is the jitter spectrum with the D/AC-2000 Ultra processing a 1kHz, -90 dBFS sinewave-the same conditions as in fig22. Note the presence of signal-correlated jitter, seen as the strong spikes spaced 1kHz apart. The D/AC-2000 Ultra's de-jittering circuit effectively filtered the periodic jitter components above 2kHz. The circuit also lowered the RMS jitter level from 66ps (fig.23) to 55ps (fig22). Although the D/AC-2000 Ultra had excellent jitter performance without the de-jittering flip-flop, it was taken a notch higher by this simple circuit. Fig. 18 Parasound D/AC-2000, waveform of undithered I kHz sinewave at -90.31 dBFS (16-bit data). Fig.20 Parasound D/AC-2000, word-clock jitter spectrum, DC-20kHz, when processing 1 kHz sinewave at 0dBFS; PS Audio Lambda transport (linear frequency scale, 10dB/ vertical div., 0dB=1ns). Fig.21 Parasound D/AC-2000, word-clock jitter spectrum, DC-20kHz, when processing digital silence; PS Audio Lambda transport (linear frequency scale, 10dB/vertical div. 0dB= 1ns). Fig.22 Parasound D/AC-2000, word-clock jitter spectrum, DC-20kHz, when processing 1 kHz sinewave at -90dBFS; PS Audio Lambda transport (linear frequency scale, 10dB/vertical div., 0dB =1ns). Fig.23 Parasound D/AC-2000, word-clock litter spectrum, DC-20kHz, when processing 1 kHz sinewave at -90dBFS; PS Audio Lambda transport; measurement taken at input of jitter-reduction circuit (linear frequency scale, 10dB/vertical div., 0dB=1ns). A close comparison of figs 22 and 23 shows that many of the periodic jitter components seen in fig 23 are also present in fig 22, but at a much lower level. For example, the spike at 5kHz can be seen in both plots. This phenomenon suggests a fundamental aspect of jitter reduction techniques: Jitter tends to be reduced in amplitude rather than eliminated. I’ve noticed, in listening to processors that use Herculean jitter-reduction schemes, that the transport and cable driving the processor still make an audible difference. 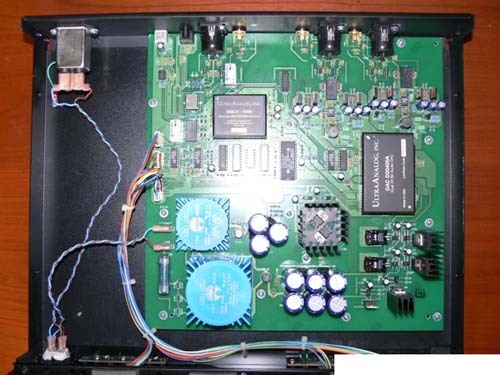 Three examples are the Mark Levinson No.30.5, with its “Intelligent FIFO,” the Spectral SDR-2000, with its “TimeStar” jitter-reduction circuit, and Theta’s Jitter Jail. All of these techniques would appear to be impenetrable barriers to jitter—but they’re not. Consequently, jitter-reduction techniques may make processors sound better and render them less transport-sensitive, but they still leave a trace of the transport’s sonic signature. Figs.22 and 23 may suggest why. The D/AC-2000 Ultra had excellent technical performance overall, with low noise, good linearity, and extremely low jitter. The Parasound D/AC-2000 Ultra sets a new benchmark in performance for $2000 converters. It sounds consistently musical and engaging, with a pristine midrange and treble, superb soundstaging, wide dynamics, and an articulate bass. Moreover, the presentation is highly detailed without being overbearing or etched. I greatly enjoyed my time with the D/AC-2000 Ultra, and was surprised to discover this level of musical quality in a $2000 processor. Even though I used the D/AC-2000 Ultra as my main converter after sending back the Spectral SDR-2000 Pro, and the D/AC-2000 Ultra was at the front end of a reference-quality play back system, I never felt musically shortchanged. Yes, the Spectral was considerably better, as was the Classe DAC 1, but the $2000 Parasound still delivered the musical goods. Compared to the similarly-priced PS Audio Ultra-Link Two, the Parasound is clearly the better-sounding unit. In short, the D/AC-2000 Ultra is a bargain and tops my list of recommended processors under $2500. I am less enthusiastic about the $950 D/AC-1100. While it sounded euphonic, the processor is simply too colored in relation to today’s $1000 processors to be recommended. The D/AC-1100 does lack the worst traits of inexpensive digital: a bright and etched treble, lack of space and depth, and synthetic rendering of timbre. Still, the D/AC-1100 is outdistanced by the Audio Alchemy DDE v3.0/DTI v2.0 combination. If your system is bright, lean, and has a recessed mid range balance, the D/AC may be worth an audition. I’ll end this review on a positive note by reiterating what a great-sounding processor the D/AC-2000 Ultra is. If you buy any $2000 converter without first auditioning the Parasound, you’ll never know just how much musical performance is possible at this price. Parasound.com had legacy info here.